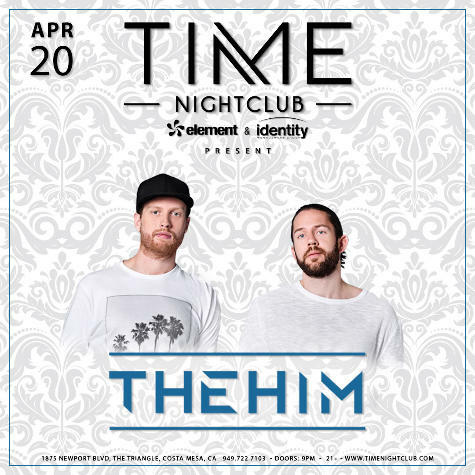 Dutch duo The Him will be playing at Time Nightclub in Costa Mesa on Thursday, April 20th. Jeroen Kerstens and Steven Berghuijs are known for tracks like their remix of Miike Snow’s “Heart Of Me“, “I Wonder“, “Balance” featuring Oktavian, and their remix of Martin Garrix’s “In The Name Of Love“, my personal favorite. The stop will be a part of their Do You Even Miss Me tour, the name of which is taken from the lyrics of “I Wonder”. Tickets for the 15+ show are $15 with doors opening at 9pm.